I have long admired my friend Lorie. She is kind, sweet, generous, and has so many other wonderful attributes that it would take a lifetime to name them all. Besides that, she is the most amazing (super talented!) paper crafter. Wow! 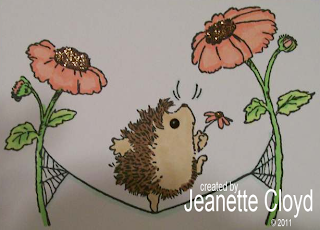 No one colors with Copics quite like Lorie! Her cards and altered items are extraordinary!!! If you haven't found her blog yet, you really should check it out. I was not in the least surprised when Lorie told me that she is now a designing artist for Peachy Keen stamps. 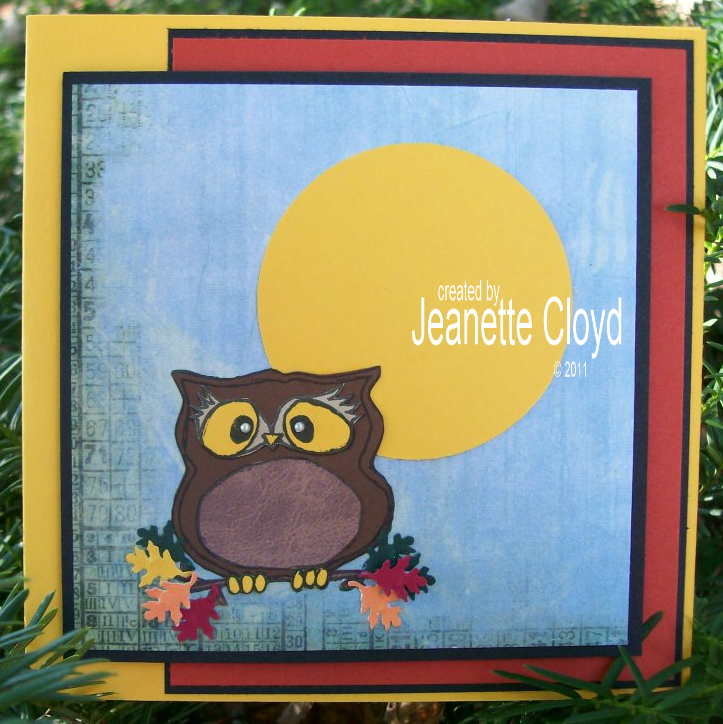 Her new line (Country Bumpkin) is making its debut today. WOW!!! Congratulations, Lorie......... and lucky us! 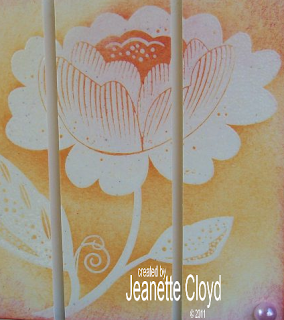 We will now have a whole new set of stamps to delight us and provide hours of creative fun! You can purchase them in the Peachy Keen store TODAY! There was all kinds of fun in the Peachy Keen sites yesterday - sneak peeks, contests, and more! 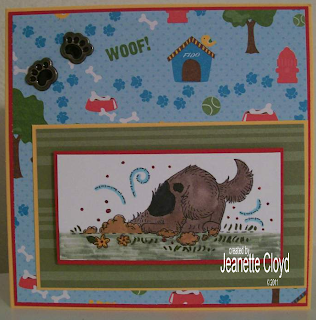 And now, today, we get to showcase Lorie's Country Bumpkin stamps! 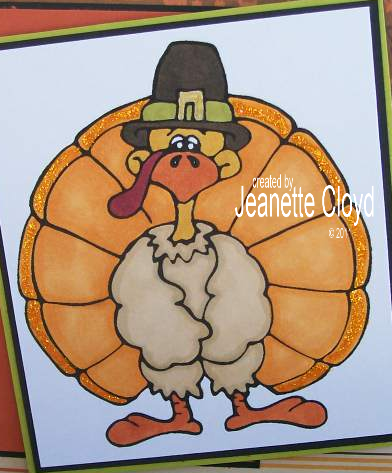 Isn't this just the cutest turkey every??? I have several more pictures... this turkey was just so photogenic and I couldn't choose just one picture to show you. Be sure to go to the Peachy Keen store to see the rest of the Country Bumpkin stamps! 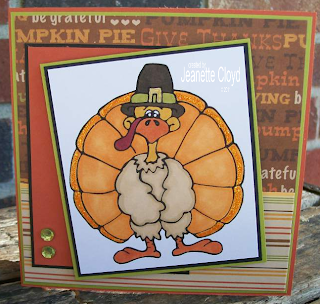 And stop by Lorie's blog and Congratulate her!!! I had moved! It was hot! (over 100 degrees kind of hot!!!) I couldn't seem to get my stamping supplies unpacked! And my stamping/creating opportunities were being left unfinished! It was ruff! RUFF!!! The July challenge in the Calendar Girls blog group was a fun one, selected by our Miss July, Michelle. I didn't get it made! And now, the end of September, I am just now doing so. EEK! I am sooooooooooooo sorry, Michelle!!! I hope you understand and will forgive my tardiness!!! Michelle's theme was a Free for all - anything goes - but with one catch! 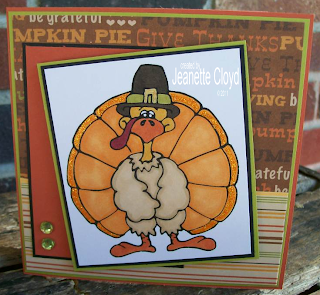 Our cards were to be created with anything EXCEPT a stamped image. 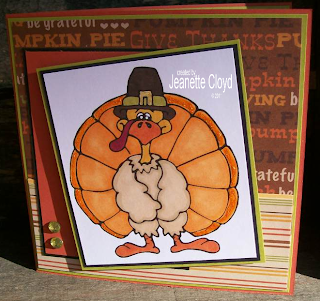 We could use punch art, stickers, embellishments, patterned paper, whatever we chose... just NO stamped image. Easy! 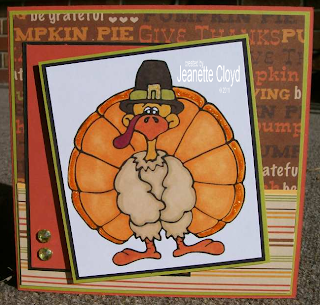 I knew immediately that I would use punch art! I love punch art!!! Fast forward to September. My daughter Brittney moved in August and now has two roomates and a petmate, too. I've mailed Brittney several cards over the years, and now her roomates admire them, too. 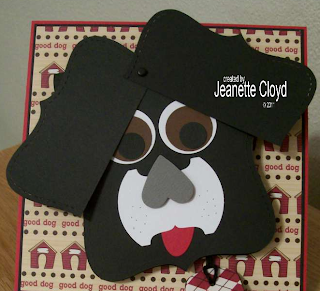 Kacee, the petmate's owner, told Brittney she wanted me to make her a card with a black dog on it. Sooooooo, my punch art card features a black dog. What's not to love about this face??? 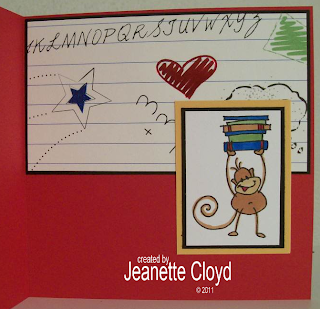 I didn't originally plan to make an easel card, but it just kind of evolved. 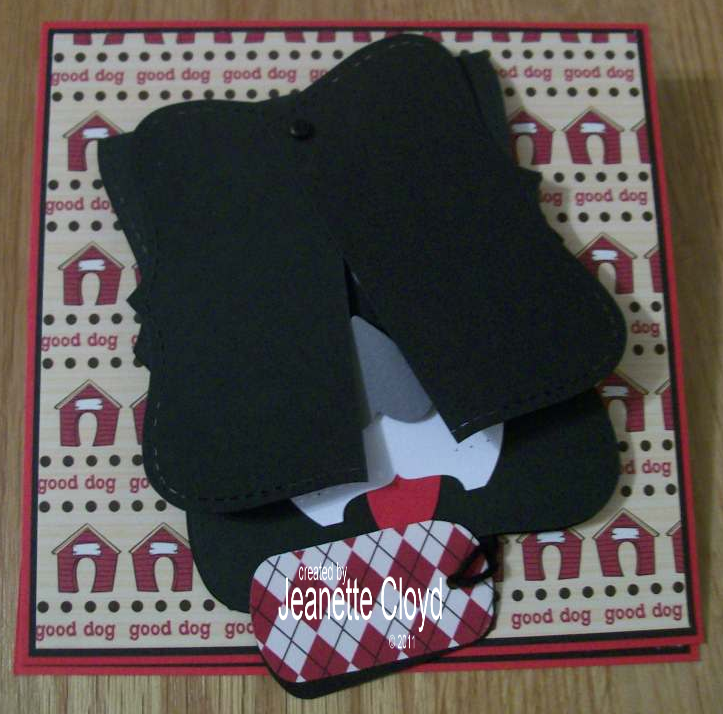 The dog's ears fold in making it easy to mail this card in a normal square envelope. 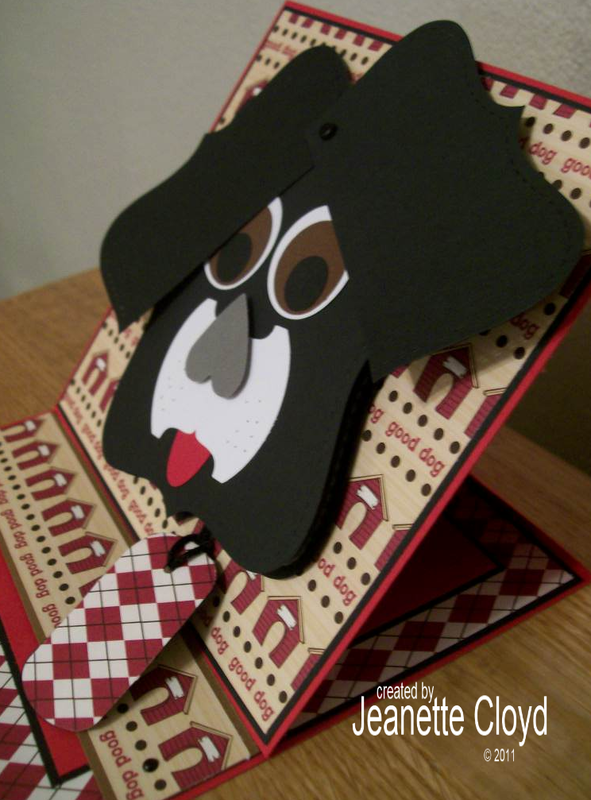 I hope my doggie card wins first place in the dog show! 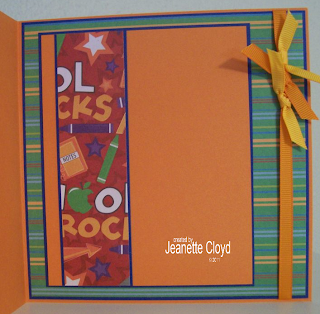 Oh, and I hope Michelle likes it, too, since it was my July Calendar Girl Anything Goes card! 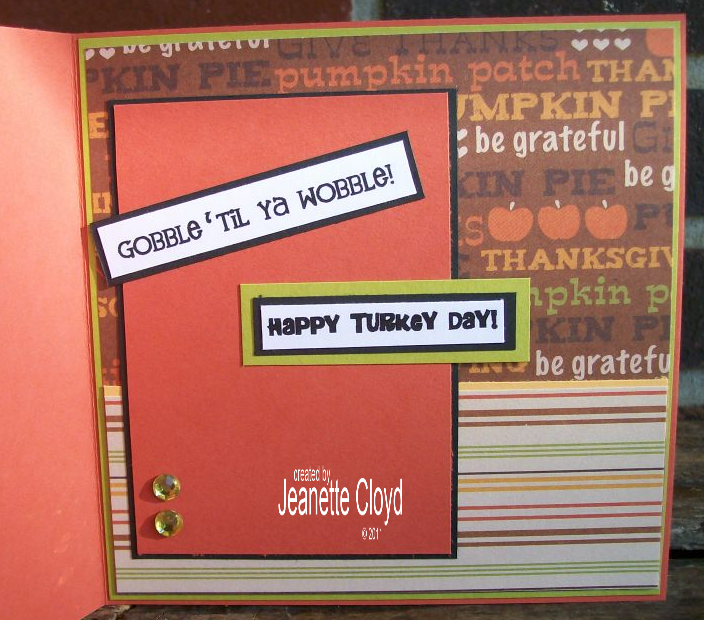 And I hope Brittney thinks I did okay creating this card for her roomate. Today is a special day... it's September 28th, so it's the day that we post our Calendar Girl monthly challenge cards! I'm so excited about this month's cards; can hardly wait to see what my friends created. Paola, our Miss September gave us choices! by selecting ONE of the THREE choices provided below. Select one of the three youtube songs I added below, and have your card reflecting part of the lyrics from your song of choice. I would also like YOU to gift your finished card to a close neighbour, or a friend that lives close to you that could use a 'pick me up'. 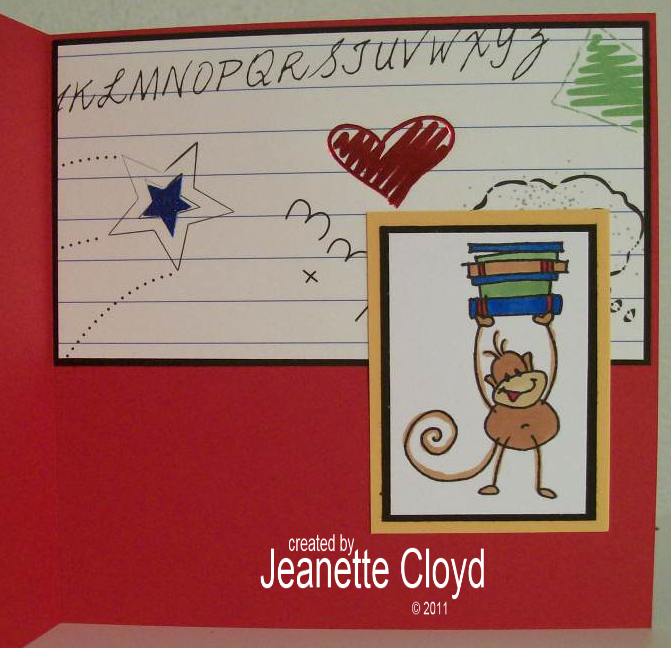 Your card should reflect anything a child may like to do: playing, reading, toys,sports etc....but with a twist! I am thrilled about hosting this month and very excited to see what you decided to create!! I just HAD to go with the second choice - EDUCATION! I admire so many teachers. They work hard to create a learning environment where their students can excell. It is often a thankless job. The responsibility is overwhelming. Thank you to all of you who are teachers!!! While I knew immediately which option I would use, I couldn't seem to settle on an image until much later. 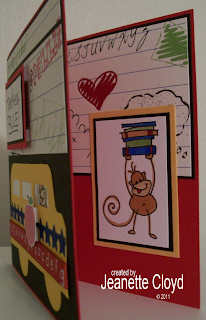 I finally went with Stamping Bella's Teachabella (and notice the APPLE, per Paola's instructions). 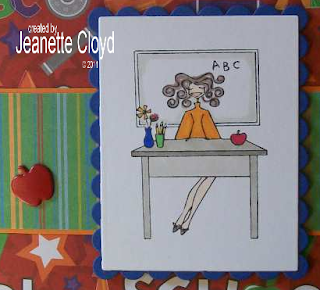 There is one on Teachabella's desk, but I also added an apple brad to my card. LOL! Common sense finally won out, though, so I went a different route. 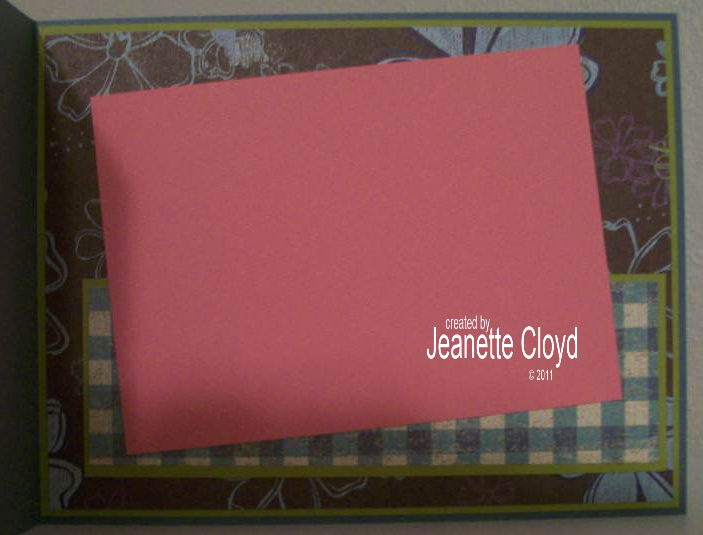 The front of the card is slightly smaller (not as wide) as the inside, so you can see the righthand side of the card both when the card is closed and when it's open. 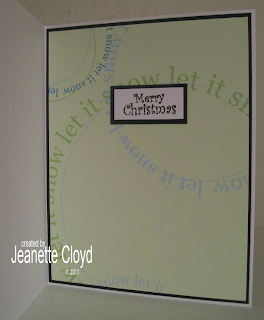 The designer papers I used were quite bold, so I went with a simple layout. 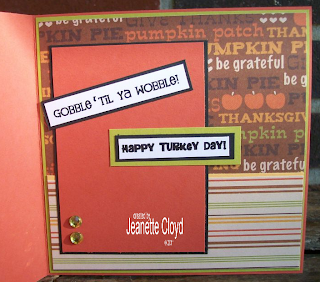 To add some appeal to the card, I also decorated the inside. I don't think this is exactly what Paola had in mind, but I'm going to send this card to my favorite teacher, my daughter! (Brittney, did you notice? I colored the teacher's hair brown just for you!) I am so proud of my daughter. In the world that we currently live, with the restrictions placed on schools and their teachers, I admire anyone who would choose to become a teacher. My daughter is one of those individuals. And she does an outstanding job!!! 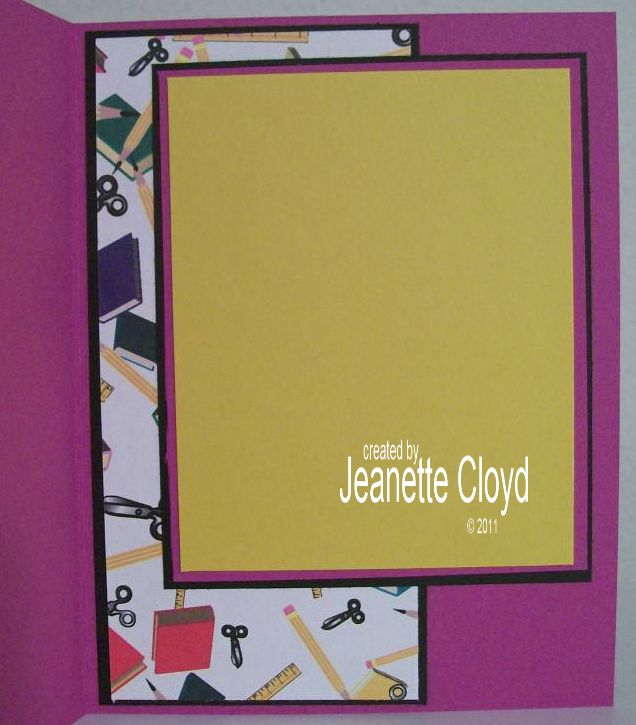 She is creative (I love some of the lessons she's put together for her students! ), she is hardworking and dedicated to the task of teaching, and she strives to treat her students with respect and fairness. Goodness, it sounds like I'm nominating her for Teacher of the Year, doesn't it? Well, if I could, I would! Paint Isn't Just for Walls! I love using found items (recycled things, etc.) 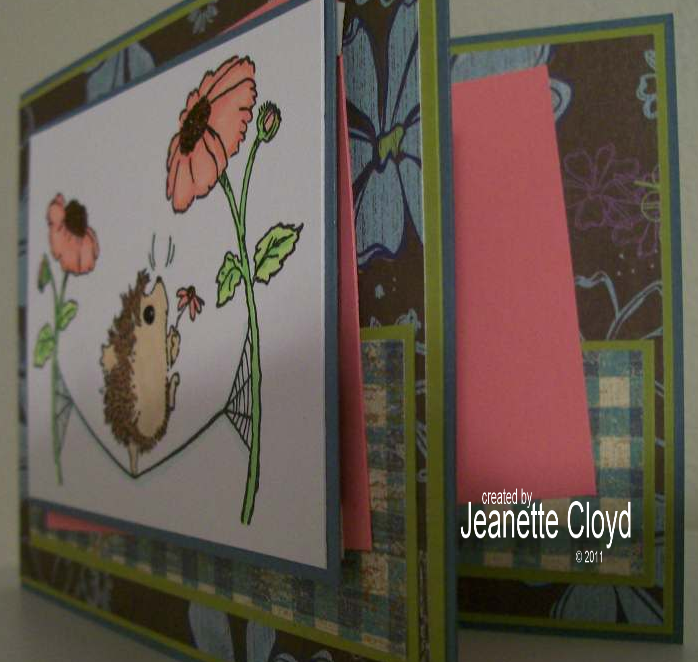 in my cardmaking. On these cards, I used paint chips (samples) to create the Christmas trees. It's THAT time of year... apple picking time. It is a long-standing tradition in our family. For many many years now, every fall we have gone to a U-Pick apple orchard as a family and had an enjoyable time picking apples. As our children grew up and left home, we continued to go. Now it's just Brock and he does love going to the apple orchard... so we still plan to go. The problem is, we've moved and we can't find the "perfect" apple orchard. For Brock, it's not just about picking apples. LOL! He wants to ride out to the orchard on a wagon pulled by the big tractor! And he wants to feed the goats and sheep and even a llama or two at the petting zoo. And of course he wants to sample the fresh apple cider (they give free samples at our "old/perfect" orchard) and even purchase a treat - apple pie, apple donuts, fudge, pastries! YUM!!! So, our search continues. We are looking for the right apple orchard for this year's outing. 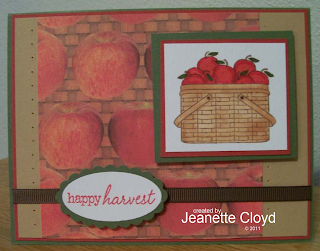 In the meantime, I have created a Happy Harvest card, complete with a basket filled with gorgeous apples! Yum! Now, where is the caramel dip to go with those apples? 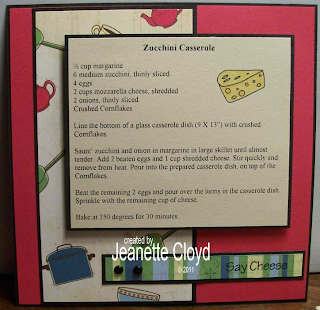 Zucchini and Cheese = Perfect Side Dish! I'm not normally one to lurk. LOL! I guess I should explain. 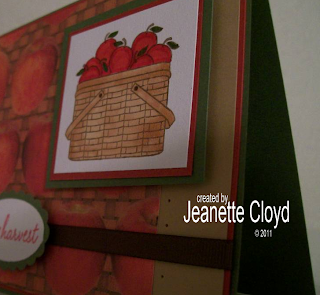 Kristyn (tryingtofindtime over on SCS) has a Side Dish Recipe Card Swap going on. I've been lurking for weeks and weeks, hoping to find time to join it. She didn't know. I was sneaky! Time was running out... the deadline was looming. Soooooooo a couple of days ago, I created the prototype and then I asked to join. It's official. I am a Swap Lurker. Perhaps one of the reasons why I like this recipe so much is because it was given to me by a dear Christian woman who was a member of one of our churches years ago. Felma was a beautiful woman and she had a beautiful soul! No one in our church loved to worship quite as much as our Felma did. 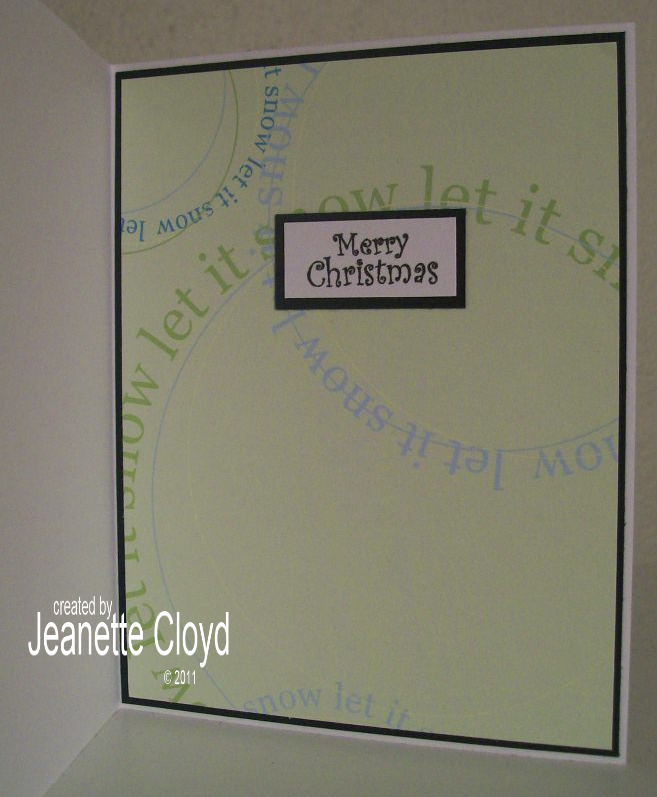 She would sing in the coir with all of her heart in tune with the Savior. Felma was not very old when she got the news - she had a brain tumor. We all prayed and wanted a complete healing, but Felma was content with whatever God wanted. He wanted her to come to Him, and she left us all too soon. So when I prepare this wonderful Zucchini Casserole for my family, I think of Felma, and I smile. I smile because I know that she is worshiping in Heaven with all the enthusiasm and joy that she has. I'm so thankful that I got to know Felma! Oh, and if you'd like to see the other recipe card I made for Kristyn's swap, you will find it on my S'more Inky AMUSEment blog. Have you heard??? 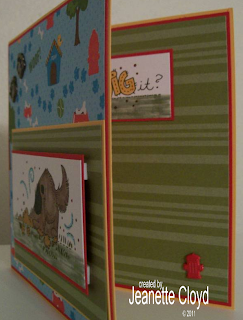 This is the last week of the Craft Us Crazy Challenge - until next February! 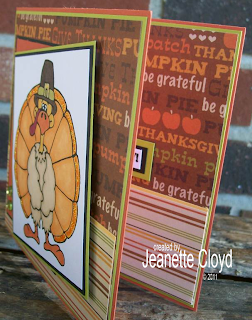 Jeri, the owner of Craft Us Crazy Challenges is preparing for a move and has so much going on in her life right now that she's decided to put the challenge blog on hold until February 2012. I totally understand and wish the very best for Jeri and her family!!! She is really a tremendously caring and wonderful person! 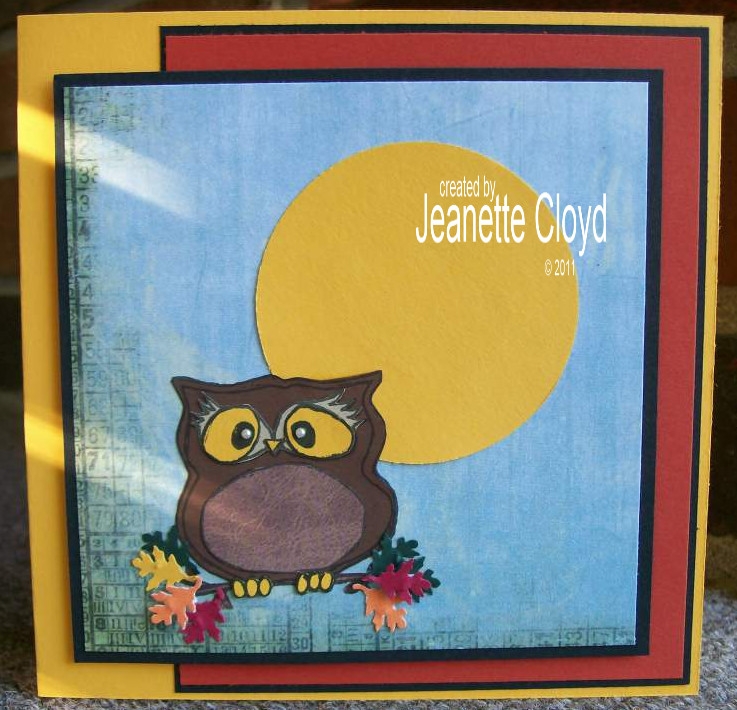 Jeri, I hope you know how much I've enjoyed the Craft Us Crazy adventure with you! THANK YOU for letting me be a part of the design team! I will be counting he moments until February! Hugs!!! 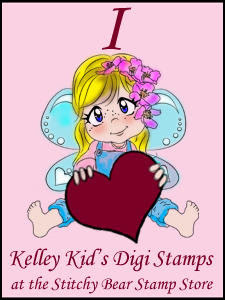 This week's sponsor is Kelley Kid's Digi Stamps, who is offering a prize package of 3 images of the winner's choice. 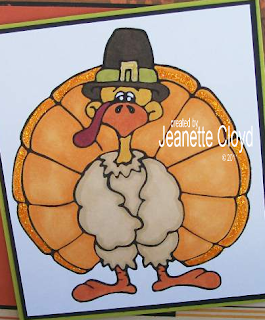 Thank you, Kelley Kid's Digi Stamps!!! 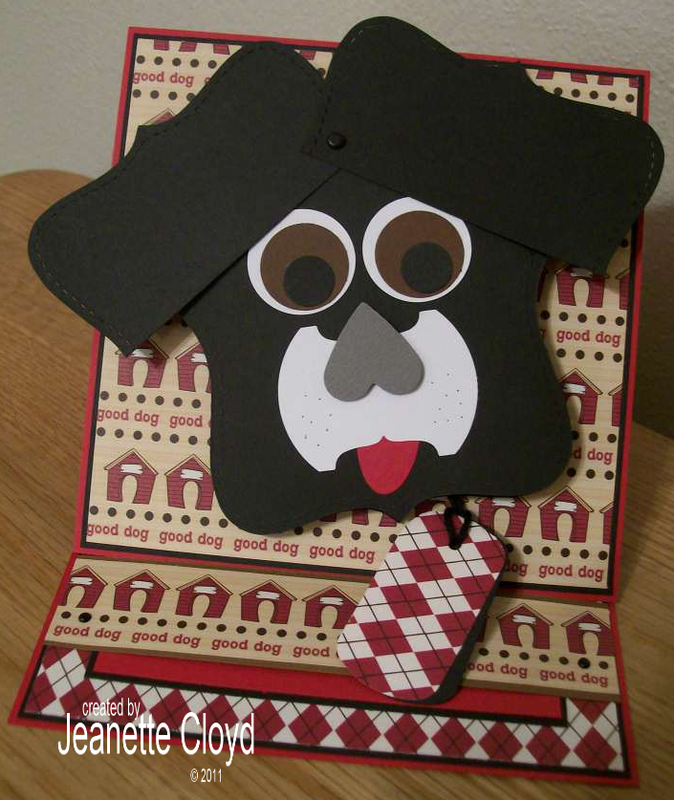 Be sure to join the fun this week at Craft Us Crazy...... it's your last chance until February! 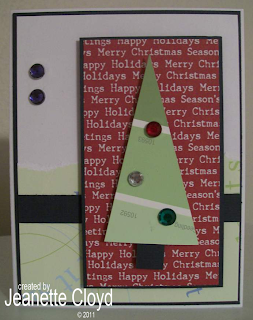 I also love my stamping friends - I have many online friends (thanks to Splitcoast Stampers)! 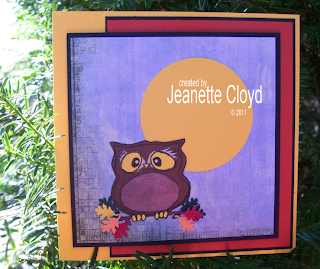 One of the fun things about online friends is that we share encourage one another in this creative outlet that we love. Karly is the hostess of the current round of the Mystery group. What is the MYSTERY group? We are a group that swaps cards every two months, with a different hostess each round. 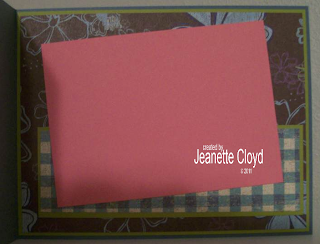 When the cards are mailed back to us, included in the envelope is the images for the next round, provided by the one who will be the hostess. 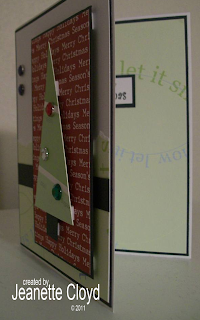 No one else knows what they will be until they arrive in our mailboxes....... and no matter what they are, we are to use them to create cards for the next round. FUN!!! Oh, and we aren't supposed to post pictures of our cards until the due date, so the rest of the Mystery swappers can't see our cards until after they have created theirs. ;) These were due September 18, so now I'm posting pictures of mine! Karly sent us an adorable hedgehog image (Penny Black Acrobat). 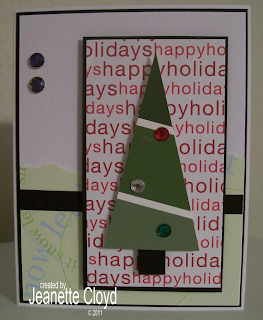 I hope Karly and the Mystery swappers like my card! I can't wait to see theirs, too!!! Thanks for a great image, Karly! You're fantastic!!! It's that time of year.... School is in Session! Today is the 15th of September. That means it's time for the Dueling Darlings. You know who we are. 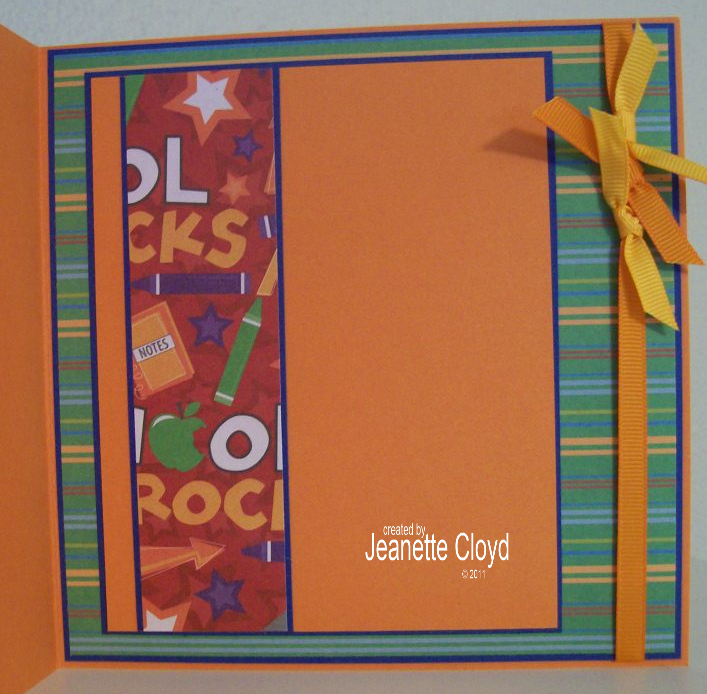 We are two groups of online friends who each month are given a kit by our respective hostesses and then create cards - all with the same theme. The Dazzlers (I'm a Dazzler) hostess this month is April. The Divas hostess is Jamie. They chose School Days as their theme. Stamps by Perfectly Clear Stamps/Stampendous ~ "School for Changito"
Black waffle paper from SU! I couldn't use them all, there were so many items! THANK YOU, April! 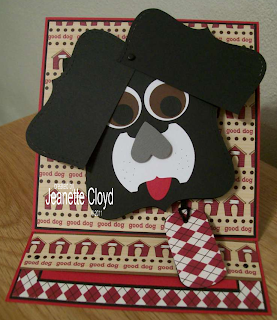 All I had to add was some red and black cardstock. 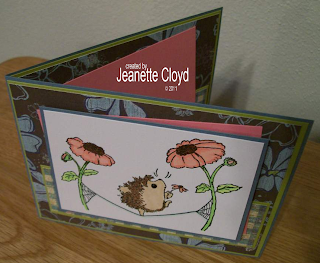 I used one of the images April sent for "inside" the bus; isn't that just the cutest little bus driver you've ever seen? 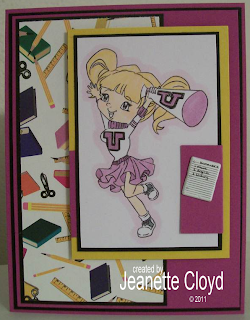 I'm so excited to see what the other Dazzlers did with April's kit... April, Darlene, Debbie, Melina, Michelle, Paola, and Terry! I'm equally excited to see what Jamie gave the Divas and to see what they created... Barb, Carol, Jamie, Joan, Judy, Kelly, LJ, and Tami! However, before we head off to check out their blogs, I must tell you about an INCREDIBLE challenge that begins today. 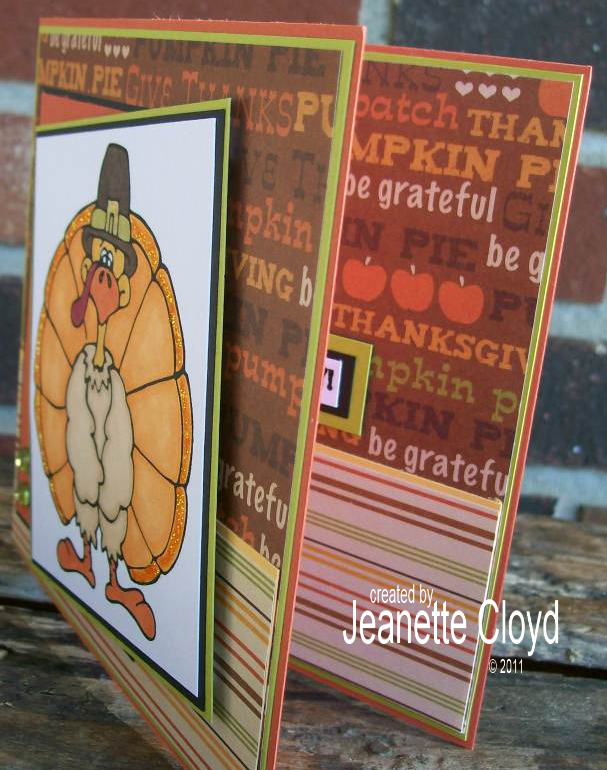 It's sooooooo cool, because the Dueling Darlings creations are appropriate for the Craft Us Crazy Challenge! Want to know why? 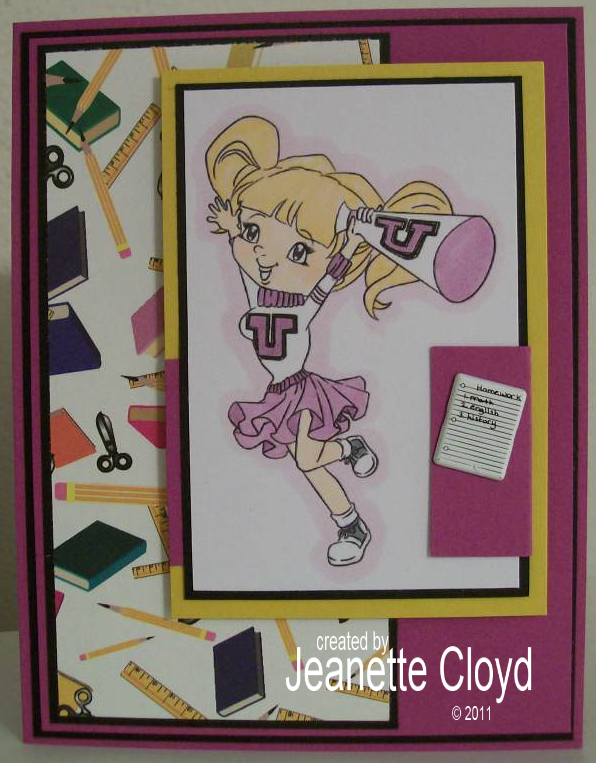 The Craft Us Crazy Challenge Theme: Goodbye to Summer (Summer Themed) and/or School Themed! 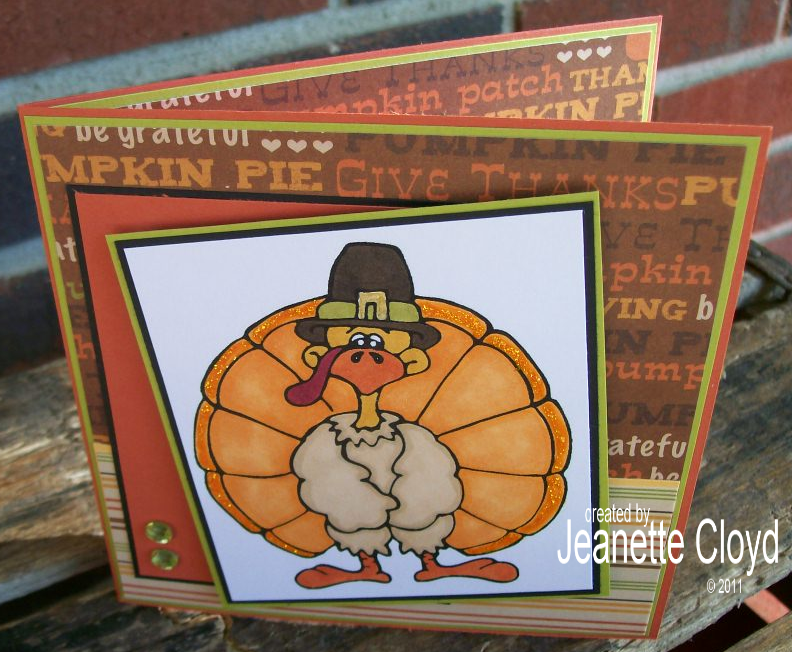 This week's Craft Us Crazy Challenge Sponsor is Meljen's Designs. They've provided an awesome gift for one of the participants, so be sure to join the fun... you just might win! I wonder what that dog is digging for? I hope he finds it, whatever it is. I don't do CAS! It scares me to try... I am afraid of failure. LOL! I love CAS! Others do it and I think it is gorgeous! When I try, it looks plain and boring. UGH! 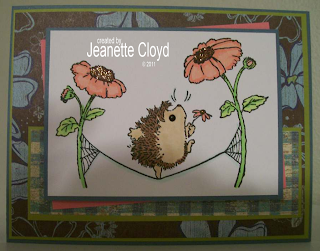 So when Gael challenged us to make CAS cards for the August Sisterhood of the Traveling Cards theme, I was petrified! What to do? What to do??? If my memory is correct, she instructed us to use no more than 2 layers (and the base counted as a layer) and 1 embellishment (not one type of embellishment, but ONE EMBELLISHMENT)! Me-oh-my!!! 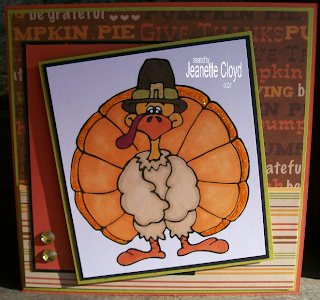 I spent some time searching the web, looking for ideas... and I happened upon a card that had cut the image apart into a mosaic kind of configuration. Hmmmmmmmm... could I do that? I decided to give it a try. 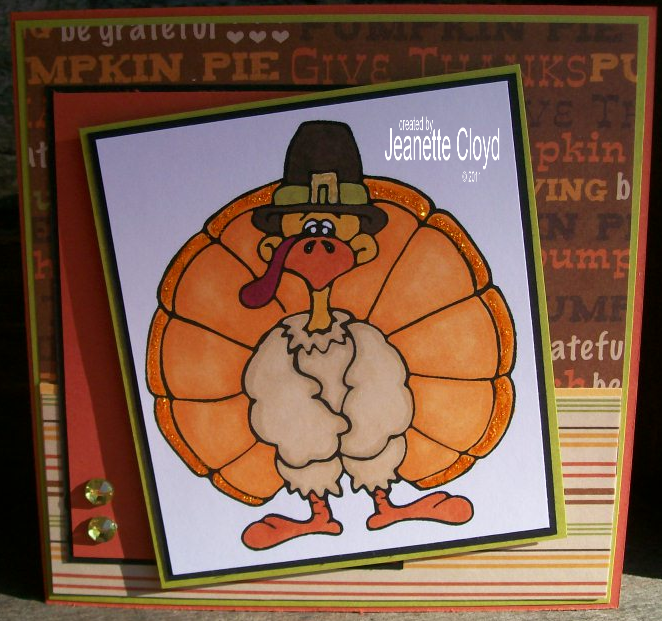 It's the first CAS card I've ever made that I didn't totally hate, so that's an improvement. 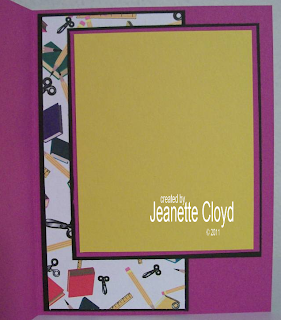 I do love the image I used! And I really like the colors, too. If Gael had allowed a few more layers, I would have put a dark piece of cardstock under the three pieces of the image (to anchor them). But she didn't, so I went with the ivory base. 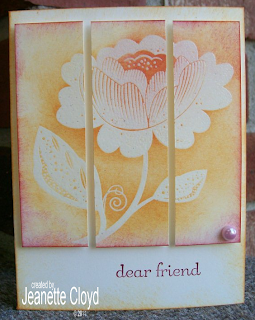 Gael is a dear friend, so I used the Dear Friend sentiment from the stamp set. I hope my dear friend likes my CAS card! Whoo thinks this little owl is darling? I do! I was inspired to use autumn colors and one of my favorite embellishments when making this card. Do you know why? That's right! 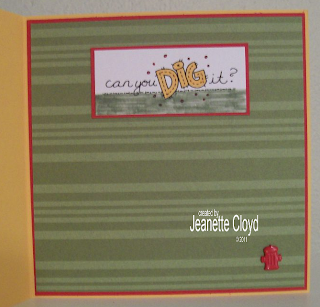 It's the theme for the current Craft Us Crazy challenge! 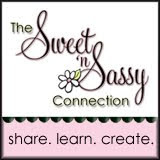 This week's Craft Us Crazy sponsor is Sweet 'n Sassy, who is providing an amazing gift for a lucky participant. 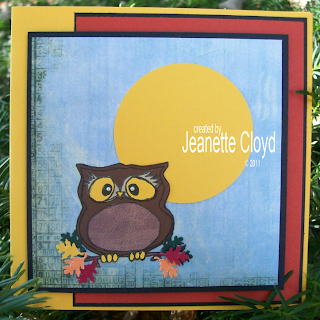 By the way, the owl on my card, that I paper-pieced... it's a Sweet 'n Sassy stamp, from the stamp set called Owl Occasions! 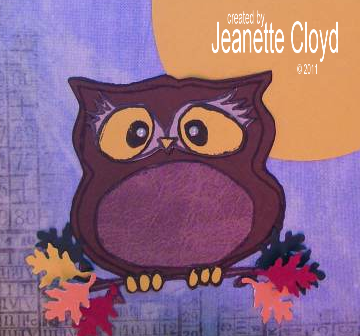 Now, WHOO wants to join the fun at Craft Us Crazy?? ?